I am a huge ice cream fan. Huge. Fine, I adore all sweets really, but ice cream probably tops cupcakes for me, which is saying a lot. Since it's been so hot in New York lately, I've been so lazy on weekends, alternating between laying out on my apartment rooftop, and running back indoors every so often for a good blast of air conditioning. 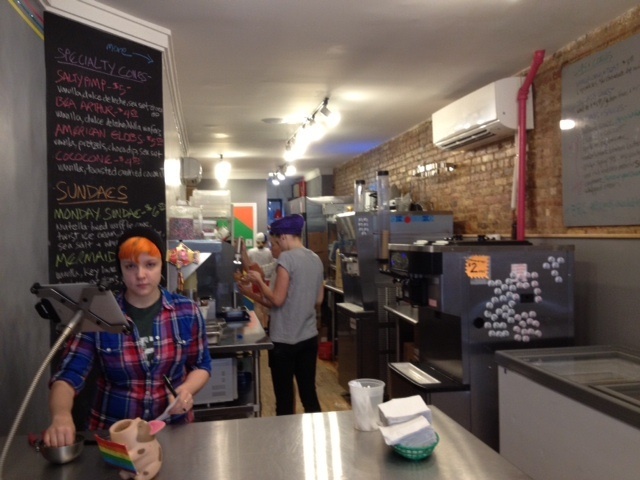 I finally decided it was time to do something productive on a Saturday, which was calling my friend up and asking if she wanted to meet for really good ice cream. 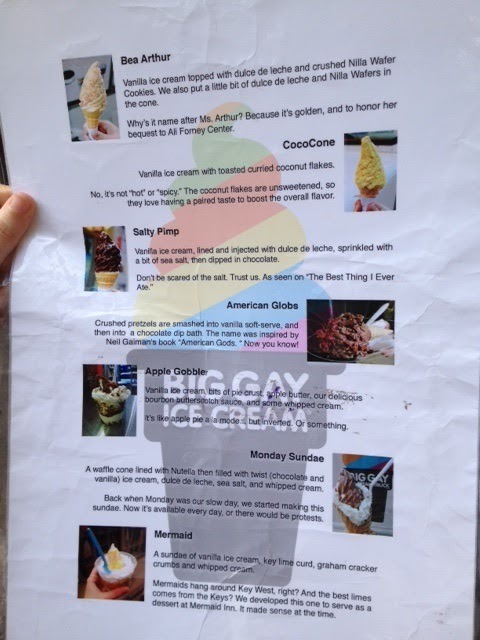 And this is how Big Gay Ice Cream came into the picture. 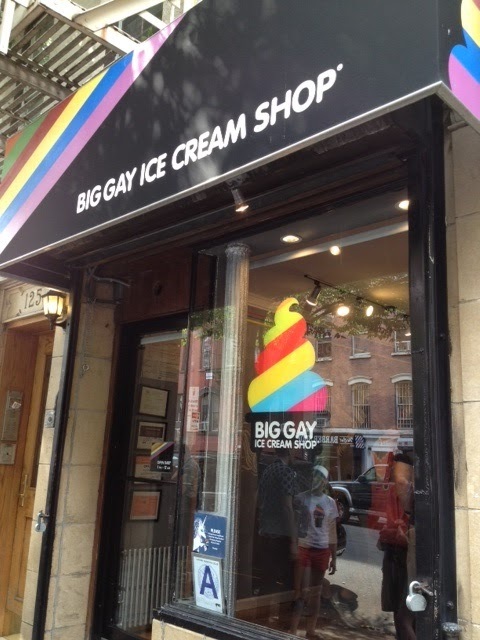 The Big Gay Ice Cream started off with the Big Gay Ice Cream truck, which still roams around the NYC streets (find out where it is via their twitter). We got to the shop at 4pm, and there was a line of 10 people outside. The good thing is that it kept moving, but it did take around 10 minutes for us to get directed in. (There's a shop employee who stands outside to greet everyone and direct the line). The plastic laminated menu that gets passed around the line. So many tempting options. There are creative combinations such as the Bea Arthur: vanilla ice cream topped with dulche de leche and crushed Nilla Wafer cookies, or the Apple Gobble: vanilla ice cream with bits of pie crust, apple butter, bourbon butterscotch sauce, and whipped cream. 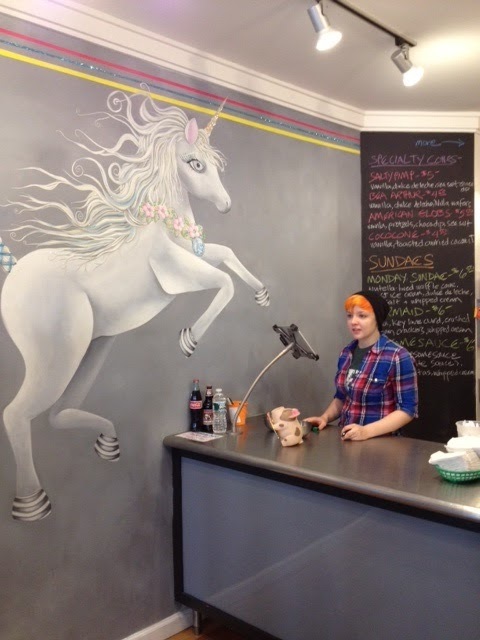 A pretty mural of a unicorn, complete with glitter on its horn! We decided on the Salty Pimp, $5: vanilla ice cream lined and injected with dulche de leche, sprinkled with sea salt, then dipped in chocolate. Truly amazing. The chocolate has that hardened shell texture similar to the Nestle Crunch bon bons I used to love as a kid. There was also just the right amount of caramel and sea salt spread around in the ice cream. Basically it was the most perfect combination. 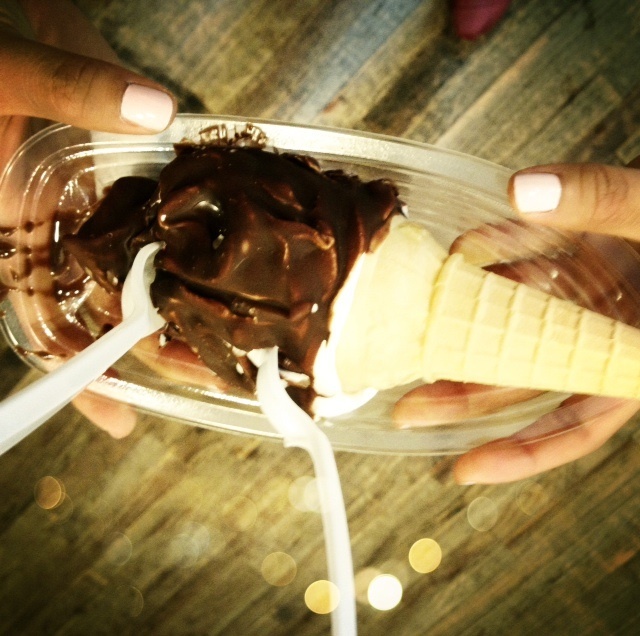 If you let the cashier know you're sharing, they'll put it in a plastic container and provide spoons as well.